The breakthrough was possible thanks to a high-end printer that allowed researchers to print soft and rigid materials together within the same components. This made it possible for researchers to design more complex shapes for the robot's legs. 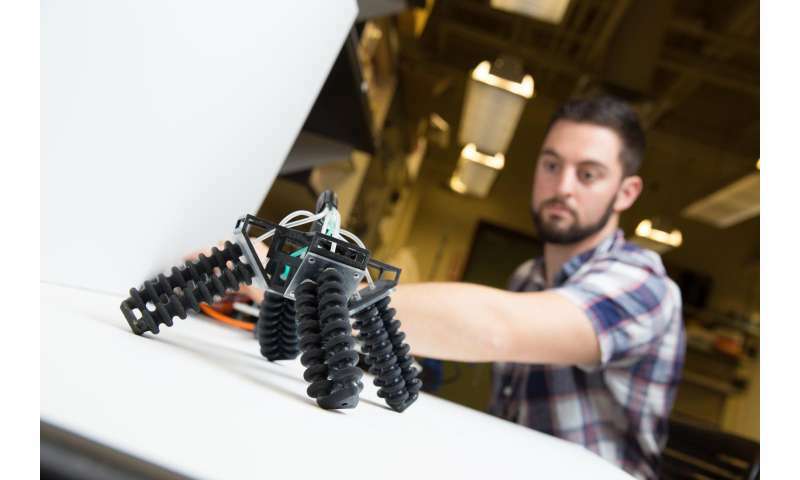 Bringing together soft and rigid materials will help create a new generation of fast, agile robots that are more adaptable than their predecessors and can safely work side by side with humans, said Tolley. The idea of blending soft and hard materials into the robot's body came from nature, he added. "In nature, complexity has a very low cost," Tolley said. "Using new manufacturing techniques like 3D printing, we're trying to translate this to robotics." 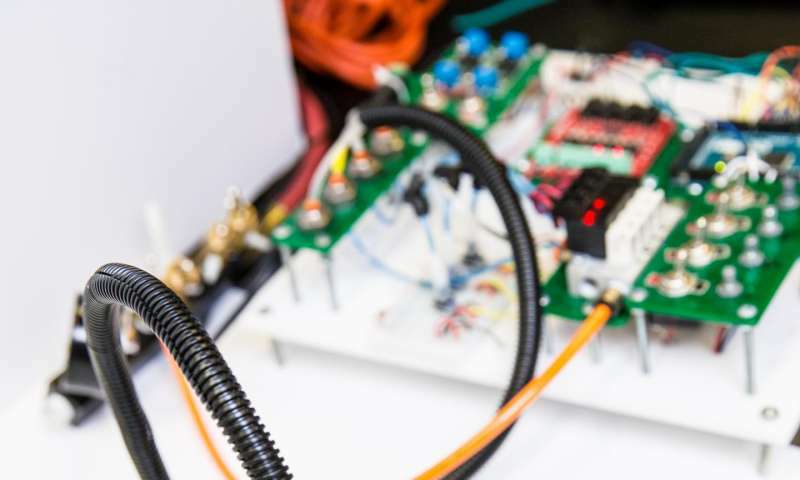 Dylan Drotman, a Ph.D. student at the Jacobs School of Engineering at UC San Diego, led the effort to design the legs and the robot's control systems. He also developed models to predict how the robot would move, which he then compared to how the robot actually behaved in a real-life environment. 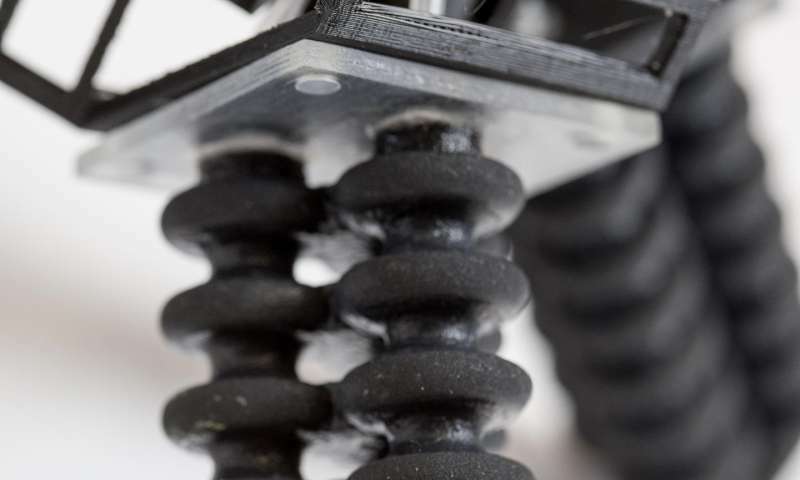 The legs are made up of three parallel, connected sealed inflatable chambers, or actuators, 3D-printed from a rubber-like material. The chambers are hollow on the inside, so they can be inflated. On the outside, the chambers are bellowed, which allows engineers to better control the legs' movements. For example, when one chamber is inflated and the other two aren't, the leg bends. The legs are laid out in the shape of an X and connected to a rigid body. The robot's gait depends on the order of the timing, the amount of pressure and the order in which the pistons in its four legs are inflated. The robot's walking behavior in real life also closely matched the researcher's predictions. This will allow engineers to make better educated decisions when designing soft robots. More information: Drotman D., Jadhav S., Karimi M., deZonia P., Tolley M. T., (2017) "3D Printed Soft Actuators for a Legged Robot Capable of Navigating Unstructured Terrain", Int. Conf. on Robotics and Automation (ICRA), Singapore, May 2017. Don't any of these researchers ever check to see what is already available on the market? Robotics companies have been using air operated flexible arms for quite a while now. Robotics companies have been using air operated flexible arms for quite a while now. You missed the '3D-printed' part. That's not on the market, yet. This is underwhelming. These researchers should be ashamed of their creation.